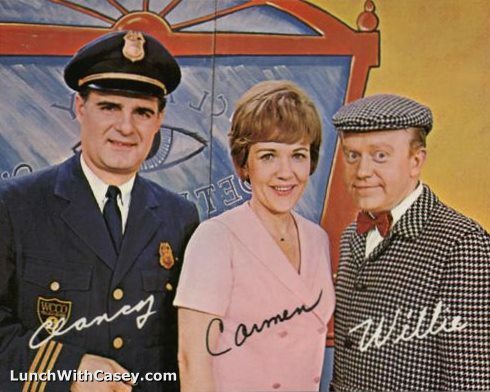 Carmen's show was usually the early one, followed by Clancy and Willie (which was then followed by Captain Kangaroo). Sometimes it would be billed as Clancy and Carmen, followed by Clancy and Willie, other times it was just Carmen and just Clancy and Willie. Confusing enough in the TV Guide, although I don't recall having been that confused when I was a kid. Here's a nice summary on Mary Davies Orfield from the Minnesota Broadcasting Hall of Fame. John Gallos is there as well, Allan Lotsberg isn't (yet), but here's a sound clip from a radio interview with him. There's a really good article on the whole Minneapolis kids' show scene, with plenty of information on Clancy, Willie, and Carmen at the great TV Party! The Clancy show is notable as the only kids’ show I ever appeared on, back in my misbegotten time as a Cub Scout. I didn’t last long as a Scout; our troop folded, and I wasn’t exactly psyched enough to join another one, but it remains to this day the only chance I’ve ever had to wear a uniform. Anyway, the big treat for our troop was the day we got to go down to the old Channel 4 studio at the site of the former Radio City Theater, to appear on the show. Since it was a morning show, the taping was done in the afternoon, after school, and then shown the next day. I remember that we sat in a bleacher kind of set-up, and that I was in the last row, since I was the tallest of the group. Other than that I don’t recall much; I know that I wasn’t on camera other than the group shot of all of us, which would have been a relief since I was far too self-conscious to want attention drawn to me. I don’t have any bad memories of it, at least; John Gallos and Allan Lotsberg always had the reputation for being very warm personalities, and I’m pretty confident they would have been good to us. I’m sure we got some kind of goody bag as well. Anyway, Clancy, Willie, and Carmen were part of the last local kids’ show on the air in the Twin Cities. They managed to stick around until 1977, when they went off the air along with Captain Kangaroo, to be replaced by many incarnations of the CBS Morning News. (How’s that working for you, CBS?) Oh, and WCCO stuck Donohue on in the morning as well—perfect programming for kids, don’t you think?